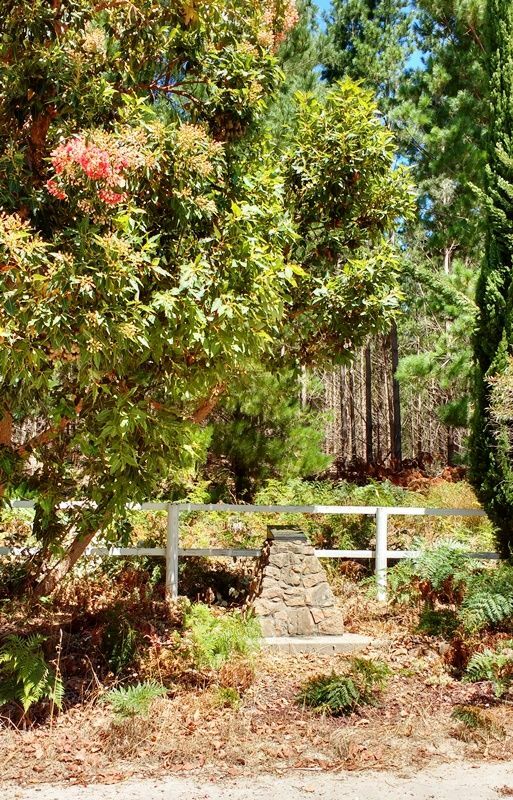 A monument commemorates the eight firefighters who lost their lives and the three who were seriously injured in the Wandilo Forest fire in April 1958. At around 10.45am on the morning of April 5, a fire was reported near radiata pine plantations in the Glencoe Wandilo area. In an attempt to stop the fire spreading, several fire trucks went down a pine break at the back of a property, where suddenly the wind speed and direction changed. Attempting to escape, two trucks became bogged in deep sand. Another was stopped in its tracks by a damaged gearbox and could not move, leaving firefighters at the mercy of the inferno raging above them. 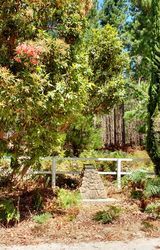 Those who perished were : Remo Quaggiato, 25, and Charles Dolling, 45, from Nangwarry; Bertram Wilson, 51, from Tantanoola; Victor Fensom, 45, from Mount Gambier; Maurice Treloar, 27, Francis Burdett, 49, and Walter Pearce, 46, all from Glencoe ; and Bernadus Damhuis, 16, from Tantanoola. In the public outcry that followed, an inquest found the men had been failed by their equipment, with vehicle fuel lines vaporising in the heat and truck cabins ill-equipped for survival situations. Forestry SA chief executive Jerome Coleman said the tragic event led to important changes for firefighters working in the south-east forestry industry. 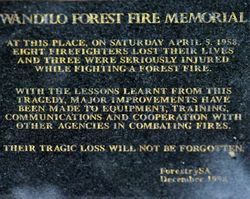 At this place, on Saturday April 5, 1958, eight firefighters lost their lives and three were seriously injured while fighting a forest fire. With the lessons learnt from this tragedy, major improvements have been made to equipment, training, communications and cooperation with other agencies in combatting fires. Their tragic loss will not be forgotten.